Natural disasters happen, and a large number of innocent people lose their lives by them. What distinguishes Iran floods crisis from other natural disasters around the world is the vandalistic role of the regime, especially the Islamic Revolutionary Guard Corps (IRGC) in its occurrence, and the regime’s vile and shameful reaction to it; suppressing, humiliating and harrowing the flood-stricken people. 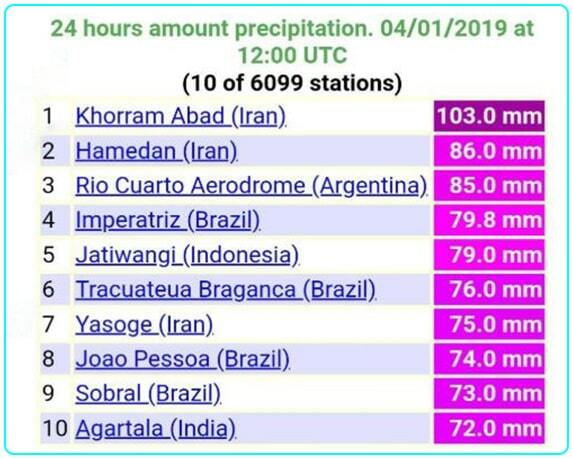 The following chart shows the amount of precipitation around the world on April 1st; there is no news of floods hitting Brazilian provinces or cities, while the country has been subjected to more amount of rain than Iran. Having no sympathy or affection for the flood-hit people, the regime’s officials are either filming or photographing themselves in these areas for propaganda or are just busy with minimizing the suffering and pain, as well as the problems that the people are facing. During Rouhani’s propagandistic visit, and that, after seven days of the flood’s onset, a flood-stricken lady hold him accountable for the situation but his answer was nothing but hollow promises. Meanwhile, there was an embarrassing competition between the regime’s officials for making more attractive propaganda, such as the walking and boat riding of IRGC’s commander in water, or the act of the Khomeini Relief Committee’s chief for helping a girl in front of the professional filming team, and the other facts that was scandalized by the Iranian social media activists. 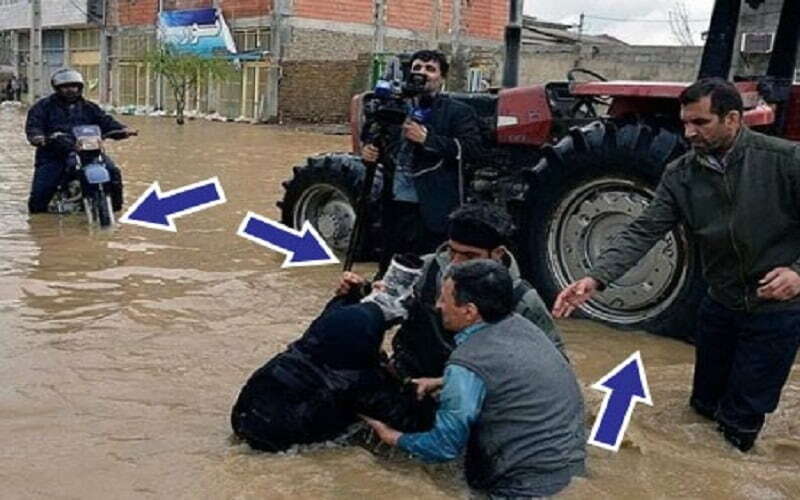 But, what is the real reason for these aberrant reactions of the regime’s officials, which, on one hand, they call catastrophic Iran floods as a God’s gift, and on the other hand, they seek to film ridiculous propaganda? In fact, there is no reason but the regime’s fright of the Iranian people’s wrath. Of course, this wrath contrary to recent floods does not target deprived people but directly targets the regime’s officials and regime’s shameful record with 40 years of failure. The regime that prefers supporting criminal Bashar Al-Assad in Syria, Lebanon’s Hezbollah, Shia Militias in Iraq, Houthis in Yemen, and nuclear adventures rather than providing the basic necessities for the Iranian people. Therefore, this is the main fright of the regime’s officials, which is going to bring down the mullahs’ rule forever.